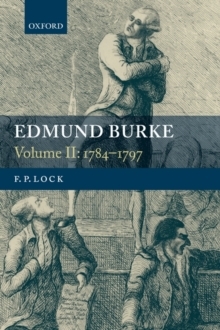 This is the second and concluding volume of a biography of Edmund Burke (1730-97), a key figure in eighteenth-century British and Irish politics and intellectual life. Covering the most interesting years of his life (1784-97), its leading themes are India and the French Revolution. Burke was largely responsible for the impeachment of Warren Hastings, former Governor-General of Bengal. The lengthy (145-day) trial of Hastings (which lasted from 1788 to 1795) isrecognized as a landmark episode in the history of Britain's relationship with India. Lock provides the first day-by-day account of the entire trial, highlighting some of the many disputes about evidence as well as the great set speeches by Burke and others. In 1790, Burke published Reflections on the Revolution in France , the earliest sustained attack on the principles of the Revolution. Continuously in print ever since, the Reflections remains the most widely read and quoted book about the Revolution. The Reflections was followed by a series of anti-revolutionary writings, as Burke maintained his crusade against the Revolution to the end of his life. In addition to these leading themes, the biography examines many other topics in its coverage of Burke's busy and varied life: his parliamentary career; his family, friendships, and philanthropy; and his often difficult and obsessive personality. There are more than thirty illustrations, including many contemporary caricatures that convey how Burke was perceived by an often hostile and uncomprehending public. Controversial in his time, Burke is now regarded as one of the greatest of orators inthe English language, as well as one of the most influential political philosophers in the Western tradition.